"At that time, most of the sequencers were designed in an electronic designer’s point of view, not a musical point of view. You could not easily program standard durations and pitches with them. Basically I made it to be used either as a simultaneous dual part sequencer of 50 notes each, or a single sequencer of 100 notes. I designed the matrix to play standard notes with the octave divided in usual semitones, within a range of four octaves. A combined four line part was dedicated to get 15 precise durations of the standard notation (full note, half-note, quarter-note, triads, etc.). One line was dedicated to glissando between any two notes and another one to legato. Several sub-sequences could be programmed, with looping between pins on the upper line. I am proud of the later idea, which was a first at that time!" "I designed the Rythmicomputer after the Matrisequencer without precisely remembering when it was. 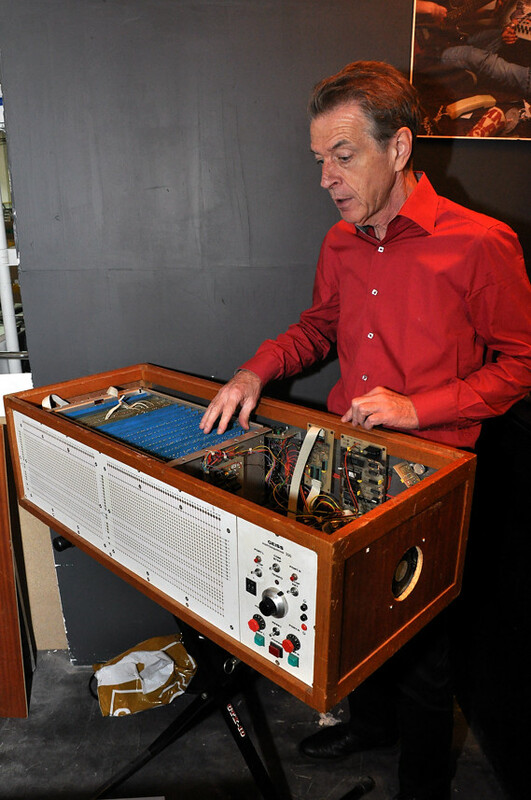 It’s a computerized rhythm box, with electronic sounds generated by electronic circuits I designed myself." instruments, which we did in Equinoxe." modify the Small Stone phaser to slow down its “sound waves”. On the other hand, I also found a way to split outputs of the Korg Minipops, so that the internal sounds could be independently processed. I also usefully added an external sync input to make it compatible with my Matrisequencer. radio processing, and several years ago I published a technical study in a French magazine on the subject. which is something many people ignore, including sound engineers! I recently went about all that in courses I was giving to students. There is obviously a loss in quality on heavily processed CDs. That being said, there are many ways of mastering music, and some are less musical than others. that little subliminal “imperfect” thing that has been understood to bring something pleasant to music. Mastering as a process can easily bring more harm than good to music! Mastering engineers should be like Hippocrates: “Do good or to do no harm”. and that it is extremely powerful, and so on. “My food is the best in town. I have a secret: my microwave oven has been specially designed for my restaurant by NASA engineers! In my work as a mastering engineer, a few years ago, I have been confronted with a surprising situation. I was asked to re-master one of our most famous artists’ albums. The record company, BMG went to Metropolis Mastering Studios in London to get it mastered. The best available equipment was used, including highly expensive monitors, and so on. But when they came back in Paris, they compared what they got with what I had done earlier on 2 of the same songs for the radio promo CD. And guess what! They called me to re-master the whole album! I mention that my equipment is very basic. All that only means that equipment, as much expensive it can be, is not the key to quality and musical sound." I would be pleased SoS doing an article on Michel Geiss. SoS staff would find kindred engineering spirit. Perhaps SoS Inviting Michel Geiss to SoS SynthFest. of JmJ credited on album cover Oxygene, Equinoxe, Rendezvous, Revolutions, Chronologie. Alongside which instruments Michel Geiss played on Rendezvous, Revolutions. (Tbh decades on I shouldn't even have to post this. Nevertheless my love of JmJ & high esteem i have for Michel Geiss). doing my best to make his projects happen in the best way, both artistically and technically." Michel Geiss far left with director Amocco Renegades. (JmJ could easily left out Michel Geiss. Not mentioned Michel Geiss at all on album covers. I would loved to experience these. Michel Geiss said JmJ is very generous). "My explanation regarding the change of sound is very simple. 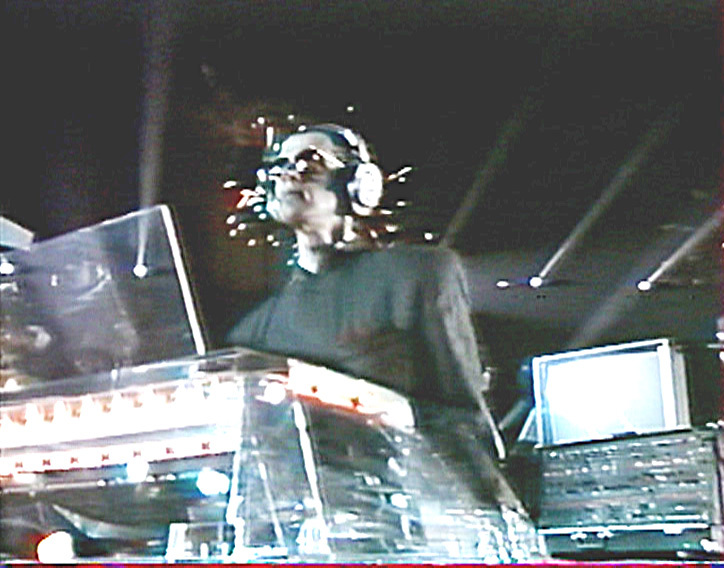 Before Oxygene, Jean-Michel only worked with very basic equipment, mostly a Revox 2 track recorder and an EMS VC3 or AKS synthesizer. At this point I find it remarkable that Jean-Michel made such an album as Deserted Palace (1972), only using one instrument! He was not wealthy enough to buy more equipment. he managed to finance the purchase of a second hand 8 track recorder and a few more instruments." which JmJ played on Oxygene4 3rd part and Oxygene5 first part (mettalic sounding tone). "I also programmed specific sounds on the ARP 2600, such as the theme sound of Oxygene IV, the waves sound in part VI"
3. 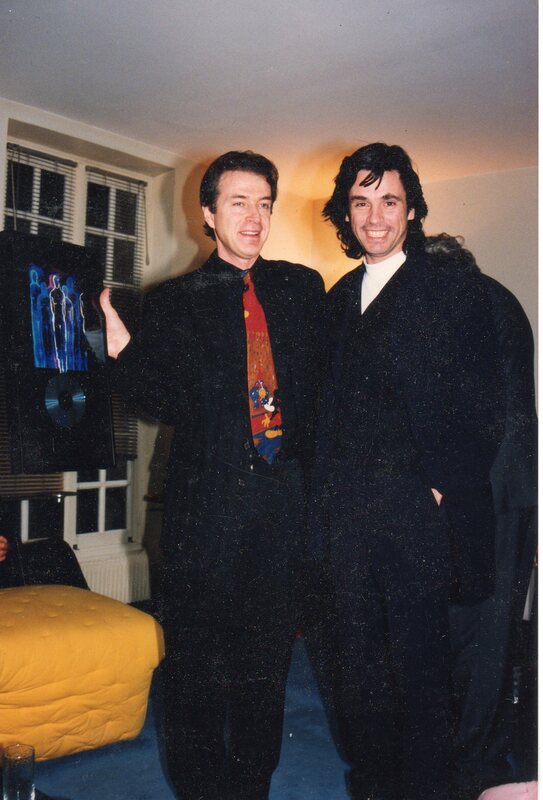 "Jean-Michel also sometimes was asking me my musical point of view"
4. "my main role was recording him while he was playing his instruments, as he needed someone to do the job. 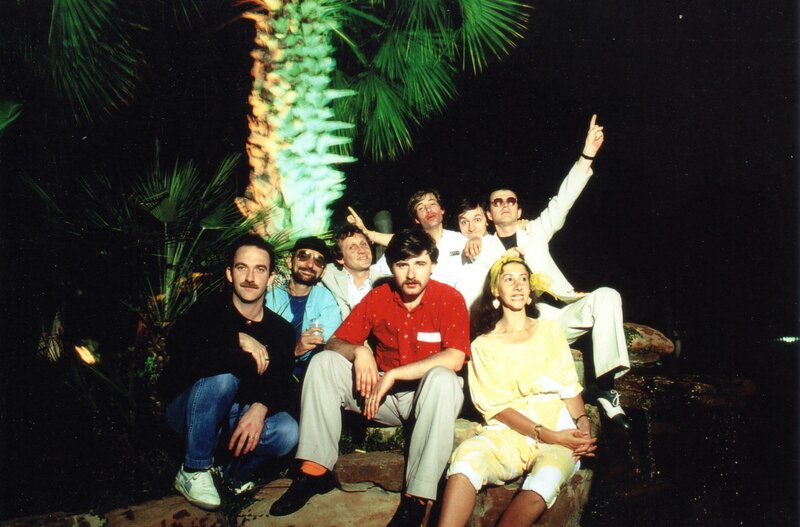 I discovered the finished record when Jean-Michel showed it to me later." 1. Michel Geiss convinced JmJ to keep Equinoxe 7 which JmJ felt wasn't good enough! 2. Michel Geiss sound designed some sounds with JmJ specifically rain and thunder sounds on Equinoxe 5, 8. 3. Designing, Constructing Matrix Sequencer, Rhytmicomputer; Modifying gear : Smallstone phaser, Korg Minipops. to build new instruments or modify existing ones to adapt them to his musical concept. which he immediately accepted as soon as I finished it. It became one of the main instruments in Equinoxe. We were starting using his new updated recorder, which became a 16 track from the earlier 8 track version. The new version was made from second hand components. "I went in railway stations recording sounds of trains"
as JmJ was searching for voices from indigenous folk Aborigine, Burundi, Eskimo, Pygmies, Quechua, Sioux. Introducing JmJ to Seiko DS-250 synthesizer, which JmJ played on Rendezvous 5.
voice synthesis card plugged into an Apple II computer. Suggesting Hank Marvin to Jean-Michel (track London Kid) as Michel Geiss is a big fan of the Shadows. 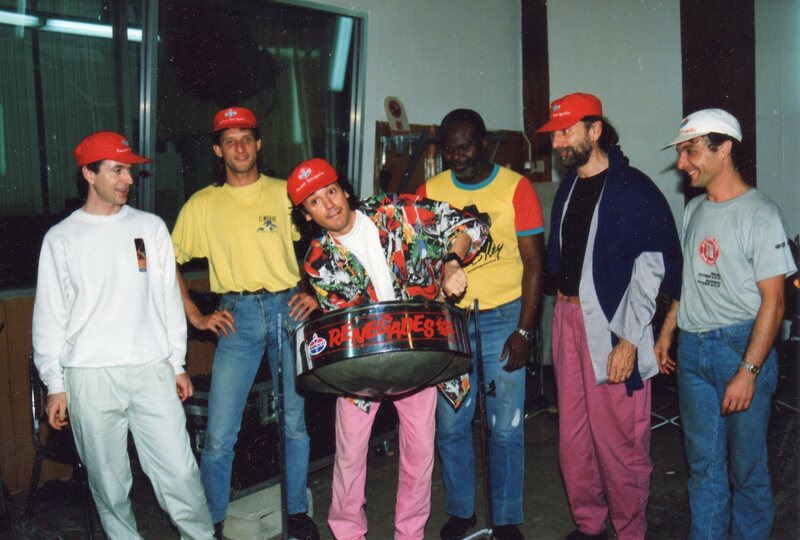 Michel Geiss played a tape of the Amoccco Renegades steel band to JmJ. (WFC title track 47 minute meditative otherness had no steel band wotwot). Thereafter 1995 JmJ & Michel Geiss parted company. "Another side of my collaboration was to oversee such processes as cassette and CD manufacturing and mastering of albums. where I met such great mastering engineers as Ted Jensen and Greg Calbi at Sterling Sound and Masterdisk. A useful experience when I had to decide on a new job." Sorting technical stuff, working on various rearrangements more suitable for large concerts, performing in concerts. Introducing JmJ to fireworks madman Daniel Azancot & projectionist Franck-Luc Dancelme. musicians Francis Rimbert, Joe Hammer, Sylvain Durand Christine Durand, Pascal Lebourg, Dino Lumbroso. 1986 (I love this band). Introducing JmJ to his longtime current PA Fiona de Montaignac. FOH Concerts in China 1981 & Europe in Concert 1993 tour. There does seem to be this bizarre fanboy thing on the interwebs about JMJ vs Geiss, with exhaustive lists like the above of all the things Geiss did which were are led to believe the evil JMJ stole credit for. As I'm getting on, I want my heroes to be straight up, to give a leg up to others (& Pro LGBT, Pro Multicultural, et al). Else I wouldn't be able to listen to their creativity any longer. I am pleased JmJ did what he did for Michel Geiss. I would have been ruffled had JmJ not done so. 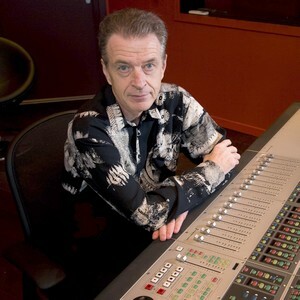 Certainly in large part due to JmJ, Michel Geiss became well regarded in audio France, as well as having a second career Mastering Engineer. Fascinating read - thank you for posting. I too enjoyed this. It seems a tad surly of the Fairlight Jarre site to throw a tantrum because they weren't getting the love they felt they deserved, but I don't know anything about the history of things there other than what they wrote on the default notice. I tried to access these links before, but hadn't thought to use a google cache or the wayback machine, so thanks for providing those links. Everything in this thread is taken from these two Google cache links interview Michel Geiss. I am glad Michel Geiss' insights are informative reading, along with I hope appreciation for Michel Geiss. I must admit I felt awkward posting this thread as it is a done and dusted from decades ago. With any artist hero, it is easy to place them on stratosphere. However JmJ is such an approachable person. Interacting, we would never think it's JmJ. Although it is easy to pour out love to JmJ. Even near 70 there is something refreshingly fresh, quirky, non cynical, non jaded, open, straight up about JmJ. Scars JmJ has, as we all have, JmJ hides well. One of the more interesting collaboration JmJ with Will Roberson. Five Percenters lyrics : conscious rap i.e. proper hiphop. "To me, large outdoor concerts are far more adapted to his style of music. Such music mainly belongs to the realms of the imagination. Anyhow, what counts the most is the audience. The public can still find the original mind of big events in a reduced size." Should this be JmJ's last outdoor in Blighty what a location.